A day trip from Ubud to a rather atypical destination: the village of the Terunyan (or Trunyan) a "Balai Aga" (aborigenal people of Bali). Their name comes from Taru (tree) and menyan (fragrance) and I will return to the importance of this fragrance in a moment. These people date way back to before Hindus came to Bali, where they now constitute over 90% of the population, an anomaly in Indonesia which is mostly muslim. The Terunyan village is situated at the foot of Mount Abang, in remote and isolated locations on the eastern coast of the Batur lake. The Terunyan society calls the community of Bali "Aga" (native). In Terunyan there is a temple called Pura Pancering Jagat. In addition, in the village, the houses still reflect a traditional home. Near this villave there ia a cemetery that can only be reached by boat via the lake. 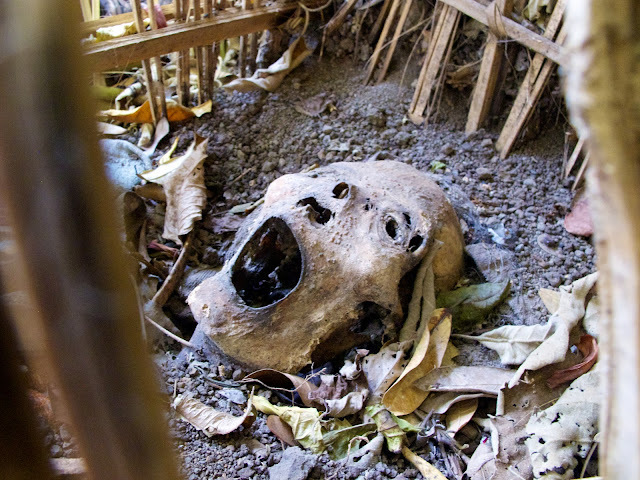 Unlike other Balinese cultures, these people do not cremate their dead. The bodies of the deceased are just laid on the ground within fenced "ancak saji" (woven bamboo). Women are generally not allowed to attend the ceremonial processions that accompany the dead to their final resting place. (Actually it is not quite "final" as I will elaborate below.) This is because of a belief that if women were allowed to partake of funeral processions this would produce a curse for the whole village. 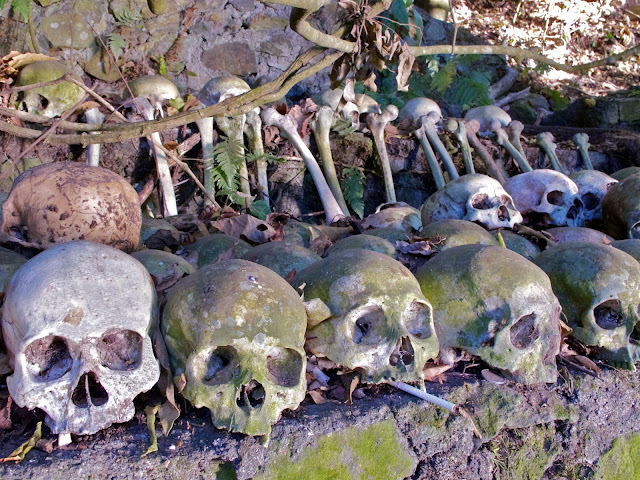 Interestingly, these bodies do not smell after decomposition begins. 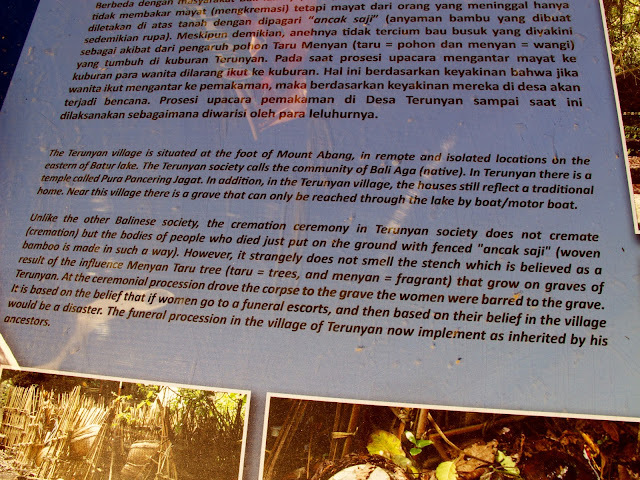 This is believed to be the consequence of the Menyan Taru trees (taru = trees, menyan = fragrant) that grow just next to the graves. A unique experience, if a quiet and sober one. Not rally an "attraction of Bali", which is how Tripadvisor classifies it. 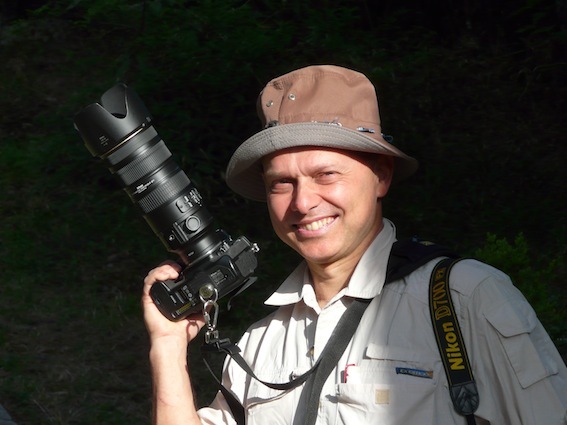 Some contributors to this most useful website compared how much time was needed to visit Tetunyan and trip prices to rafting or market browsing. There are actually three cemeteries. The first is for children. It is called the Semà (cemetery) Muda (youth). The second one is the Semà Bantasi and it is for those who die in accidents or because of illness. The third one, which we visited, is called the Semà Wayah (old people) and it is for people who were married and die of natural old age. Only eleven people are buried there at any one time. When additional elderly people die, the ones who were placed there first are moved to an adjacent site and their skulls and bones are lined up. As for the trees, I could indeed small a fragrance, but won't attempt to analyze what effect this can have on the preservation of the cadavers. The legend has it that in the old days the elderly were asked what to do with these trees, whose smell was so strong that it made people sneeze all the time. They advised villagers to plant the trees next to the dead so that the stench from decomposition would be balanced with the fragrance. Our local guide Agung also relates another legend according to which the stench of the dead is sucked in by a network of natural tunnels under the cemetery.